Charming beach of Razo, 5 bedrooms, for 10 people with garden. The beach house of Razo, is a beautiful house with charm, less than 300 m from the sea, in the Costa da Morte. It has 5 bedrooms and 3 bathrooms on two floors. Outside it has 3 porches. It has been carefully decorated, have recovered wood and old pieces, it is a house with a soul that is perfect to enjoy inside and outside the various spaces within which are found throughout the house. It is in the natural setting of the beach of Razo, one of the most important and spectacular protected areas of Galicia, known as natural space of Razo-Baldayo, consisting of beaches, dunes, marshes and a beautiful saltwater lagoon that becomes a large natural pool. The house is well-connected by motorway, is within walking distance of everything, La Coruna 30 minutes, 45 minutes from Santiago, Finisterre 50 minutes. So its location is ideal as a base to explore Galicia. Razo you can find bars, cafes, terraces to eat or tapas and even a small supermarket to buy the basics. Very close, just 10 minutes away is the town of Carballo, find everything, supermarkets, shopping centers, shops of all kinds, bars, cafes, restaurants, medical centers, spa ... and a busy local market held every Thursday and alternate Sundays. You can go surfing, horseback riding, walking along the beach ... The "Ruta dos Pinos do Mar" passes only 300 m from the house, is a coastal path that runs through the beautiful natural landscapes ranging from Caión to Malpica, through Beach Razo-Baldayo. All sections are parallel to the coast, crossing cliffs, mountains, rolling hills and beaches, you can be done by car, bike or walking. It is a feast for the senses! no wonder the area is known as the jewel da Costa da Morte !!! The house is precious and very comfortable, the whole ground floor is accessible to persons with limited mobility, is excellently communicated by highway and turns out to be ideal as base to cross Galicia, is near everything. To spend the moment in porches and to be walking to the beach is a delight. Besides all that it is surrounded by soft mountains and by the sea, in the natural space of Razo Baldayo's Beach, in one of the best beaches with Galicia, certainly one of the Galician wonders away from the masses tourism where it will be able to enjoy of the nature in all his explendor. Inside the plot that is totally closed, there is zone of parking. The house has a wide lounge and conference to the garden. Across the lounge it leaves directly to one of the porches with a nice zone of being. The house has 2 fully equipped kitchens: One inside open to the living room. The other on one of the outdoor porches, is a beautiful and comfortable space inside, with dining room and barbecue. Razo's beach is one of the best of Galicia for the practice of the surf. The house is in the natural setting of Razo beach, one of the most important and spectacular protected areas of Galicia, known as the Razo-Baldaio natural area, made up of beaches, dunes, salt marshes and a beautiful saltwater lagoon that It becomes a great natural pool. 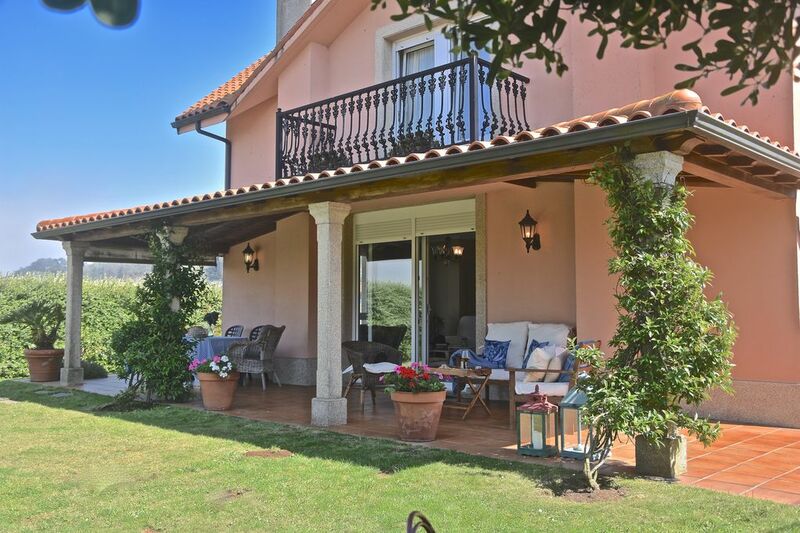 The house is well-connected by motorway, is within walking distance of everything, La Coruna 30 minutes, 45 minutes from Santiago, Finisterre 50 minutes. So its location is ideal as a base to explore Galicia. You can go surfing, horseback riding, walking along the beach ... The "Ruta dos Pinos do Mar" passes only 300 m from the house, is a coastal path that runs through the beautiful natural landscapes ranging from Caión to Malpica, through Beach Razo-Baldayo. All sections are parallel to the coast, crossing cliffs, hills, mountains and beaches. It is a treat for the senses!, Not surprisingly the area is known as the jewel da Costa da Morte !!! Somos una familia que pasamos 5 noches en un paraje excepcional.Las condiciones de la casa playa de Razo son inmejorables y sus pripietarios Eva y Roberto son excelentes tanto en el trato como en su excepcional hospitalidad.La casa supera incluso la belleza de las fotos mostradas.Fuimos con 3 niñas y disfrutaron muchisimo y los adultos gozamos de un regalo para los sentidos.Sin duda gracias por hacernos pasar unos dias maravillosos.Repetiremos seguro!! Estuvimos tres días en abril y nos encantó la casa. Se ajusta exactamente a todo lo que describe el anuncio. El trato con Eva estupendo, aclarando todas nuestras dudas y discurriendo el encuentro tal como habíamos planeado. Todo lo encontramos muy limpio y con el detalle de ofrecernos unas ricas frutas para la llegada. La casa es muy agradable y con todo lo necesario para pasar unos estupendos días de asueto. Es muy recomendable y nosotros volveriamos de nuevo. Muchísimas gracias Conchi por vuestra estancia y por este comentario tan bonito. Mil gracias de nuevo y hasta cuando queráis! Los propietarios más amables y comprometidos que jamás hemos visto, llevamos más de quince años de turismo rural, tanto en invierno como en verano, y lo dicho, nunca hemos encontrado personas tan dispuestas a ayudar , tanto en información normal del lugar , como el primer día que Eva nos compró la cena que le habiamos pedido y eso que no era fácil, pero siempre brindandose para ayudar en todo . Un 11 sobre 10 para Eva y Roberto, sin duda este es su negocio lo bordan . Fantastisches, sehr liebevoll eingerichtetes Haus, vor allem Abends haben wir den Cheminéeofen sehr geschätzt. Grossartig auch die Ankunft mit persönlicher Begrüssung durch die Besitzer, der Früchtekorb, das Bier, das WC-Papier, das Holz und die Verfügbarkeit bei Unklarheiten. Absolutes 5-Sterne Ferienhaus zu einem fairen Preis. Razo ist ein bezauberndes Fleckchen Erde! Vielen Dank für alles Simone. Für uns ist es eine wahre Freude gewesen, Sie zu empfangen. Sie werden willkommen sein, wenn Sie wollen. Muchas gracias por todo Simone. Para nosotros ha sido un verdadero placer recibiros. Seréis bienvenidos cuando queráis. The house is in the natural setting Razo Beach, one of the most important and spectacular protected areas of Galicia, known as natural space of Razo-Baldayo, consisting of beaches, dunes, marshes and a beautiful saltwater lagoon that It becomes a natural pool. Razo you can find bars, cafes, terraces to eat or tapas and even a small supermarket to buy the basics. Very close, just 10 minutes away is the town of Carballo where you can find everything, supermarkets, shopping centers, shops of all kinds, bars, cafes, restaurants, medical centers, spa ... and a busy local market held every Thursday and alternate Sundays. *Puede ver más información en la web del propietario www.vilanovaa.com * You can see more information in owners web www.vilanovaa.com **En el caso de mascota, consultar previamente con el propietario. En este caso será necesario abonar 200 € en concepto de fianza, que será devuelta una vez se compruebe que todo está correcto. **In the case of pet, consult the owner in advance. In this case it will be necessary to pay 200 € as a deposit, which will be returned once it is verified that everything is correct.